American family, resident in the southern part of the United States. First of the family in North America; son of Isaac Harby, lapidary to the emperor of Morocco. He settled at Charleston, S. C., where his son, Isaac Harby, was born. Journalist; born 1788; died in New York 1828; studied law, but subsequently opened a school on Edisto Island, S. C. He afterward edited the "Quiver," the "Investigator" (later known as the "Southern Patriot"), the "City Gazette" (1822), and the "Charleston Mercury." He was also distinguished as an author and playwright. His first play, "The Gordian Knot," was written in 1807; it was followed by "Alexander Severus" and by "Alberti" (1819), his best-known play, at the first performance of which President Monroe was present. As a political writer he became widely known by his "Letters on the Presidency" (1824). 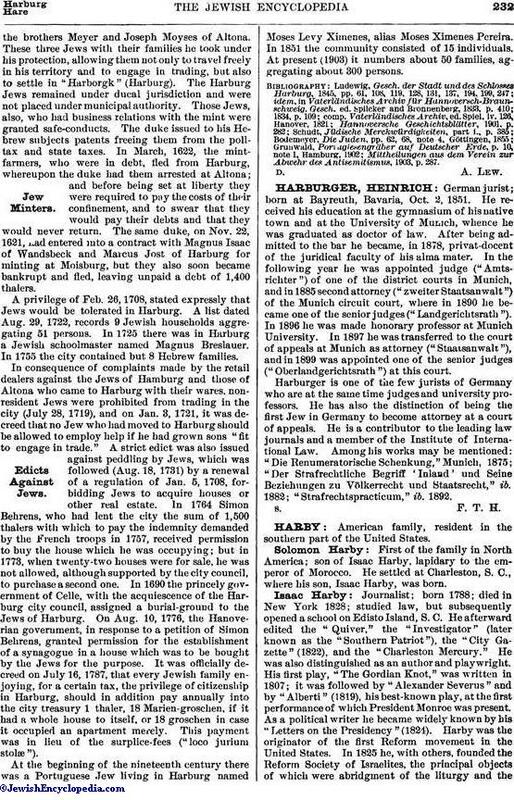 Harby was the originator of the first Reform movement in the United States. In 1825 he, with others, founded the Reform Society of Israelites, the principal objects of which were abridgment of the liturgy and theintroduction of English into the service. An account of his work in this connection may be found in the "North American Review," xxiii. Harby included among his friends Thomas Jefferson, Edward Livingston, and Sir Walter Scott. In 1828 he removed to New York, where he established a school and contributed to the "Evening Post." His remains are interred in the old cemetery on Eleventh street, New York. Captain in the United States navy. Brother of Isaac Harby; born in Georgetown, S. C., 1793; died at Galveston, Texas, 1870. At nineteen he became a midshipman in the United States navy, and during the War of 1812 was taken prisoner by the British, and was confined in Dartmoor Prison until the close of the war. In 1823 he was sailing-master on the U. S. vessel "Beagle." He subsequently became a captain in the Revenue Marine Service, and also served under Commodore Porter in the antipiratical squadron. Captain Harby took part in the Texan war of independence, and served in the Mexican war, the Seminole war, and the Bolivian war of independence. 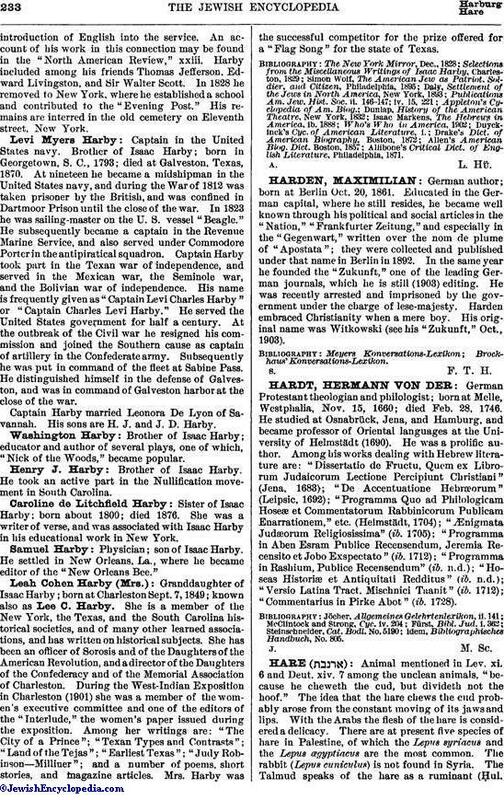 His name is frequently given as "Captain Levi Charles Harby" or "Captain Charles Levi Harby." He served the United States government for half a century. At the outbreak of the Civil war he resigned his commission and joined the Southern cause as captain of artillery in the Confederate army. Subsequently he was put in command of the fleet at Sabine Pass. He distinguished himself in the defense of Galveston, and was in command of Galveston harbor at the close of the war. Captain Harby married Leonora De Lyon of Savannah. His sons are H. J. and J. D. Harby. Brother of Isaac Harby; educator and author of several plays, one of which, "Nick of the Woods," became popular. Brother of Isaac Harby. He took an active part in the Nullification movement in South Carolina. Sister of Isaac Harby: born about 1800; died 1876. She was a writer of verse, and was associated with Isaac Harby in his educational work in New York. Physician; son of Isaac Harby. He settled in New Orleans, La., where he became editor of the "New Orleans Bee." Granddaughter of Isaac Harby; born at Charleston Sept. 7, 1849; known also as Lee C. Harby. She is a member of the New York, the Texas, and the South Carolina historical societies, and of many other learned associations, and has written on historical subjects. She has been an officer of Sorosis and of the Daughters of the American Revolution, and a director of the Daughters of the Confederacy and of the Memorial Association of Charleston. During the West-Indian Exposition in Charleston (1901) she was a member of the women's executive committee and one of the editors of the "Interlude," the women's paper issued during the exposition. Among her writings are: "The City of a Prince"; "Texan Types and Contrasts"; "Land of the Tejas"; "Earliest Texas"; "Judy Robinson—Milliner"; and a number of poems, short stories, and magazine articles. Mrs. Harby was the successful competitor for the prize offered for a "Flag Song" for the state of Texas. Allibone's Critical Dict. of English Literature, Philadelphia, 1871.